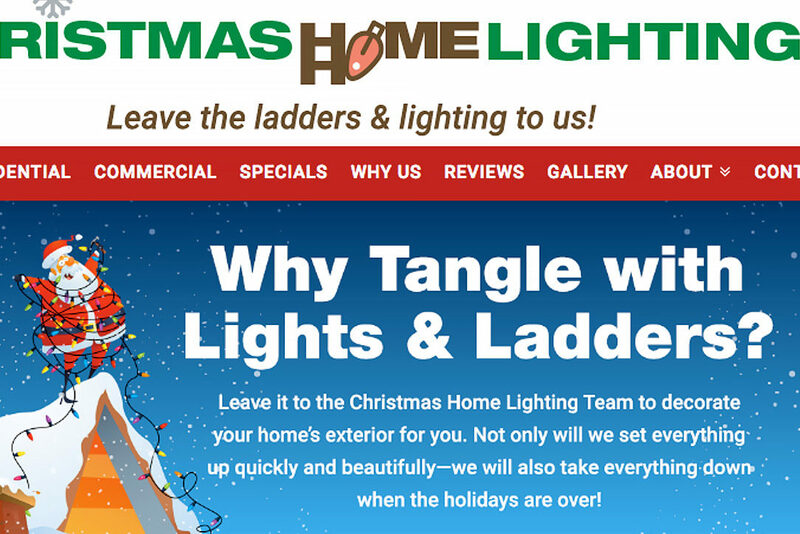 To launch a holiday lighting service via website and search. First we studied their competitors’ sites – including the local, state, and national levels – to better understand the marketplace and good/bad ideas that others have had in the industry. Following that analysis and wishlist conversations with the client, we developed a sitemap that plotted out the topic of every page and its place within the site structure. Next, we developed a new logo for them, using a ladder for the “H” and a Christmas light for the “O” in “HOME,” to graphically telegraph the business’s services. The approved logo gave us our color palette, and we created home page designs. The home page immediately introduces the problem/solution of the service and captures the joyfulness of the season. (Virtually all competitors had dark sites so they could show their lit homes at night, but we found that overly somber and “heavy” for the subject matter.) We also placed a “Free Estimate” form into the footer of every page, so any reader’s impulse to go forward would be satisfied and sent nearly instantly. This is a new business venture as of this writing, but hopes are high that the tone and message will appeal to homeowners and businesses who are looking for help in hanging their outdoor Christmas lights!